Most of you will be familiar with the term Yoga, and probably think of it as a form of exercise, but in fact, its origins are in healing and spiritual development. Yoga is the Sanskrit word for union – the relationship between mind, body and spirit. Records suggest that this holistic approach to life was practised over 5000 years ago by Hindu ascetics or ‘Yogis’. Yoga was just one part of the ancient Indian medical system of Ayurveda, and was developed to find a way to balance the harmony of the emotional, mental, physical and spiritual needs of an individual. There are several branches of yoga, that have different beliefs at their core. For example, the ‘Royal Path’ sometimes referred to as the ‘king of yogas’, is about creating inner happiness and positive change in society at large through mastering self-order and control of mind. Bhakti yoga – love & devotion, Kriya yoga – cleansing, Jnana yoga – intellect, Karma yoga – work & duty. You may be most familiar with the term Hatha yoga, which is very popular in the West and which translates as ‘balance of body & mind’. It was used as a way to prepare the body for meditation and spiritual practise. It is closely tied to the ‘eight limbs’ spiritual growth path – an eight-stage process, to create balance, strengthen the body and calm the mind. Yama: Restraint – behaviour towards others. Niyama: Self Discipline – behaviour towards yourself. Asanas are the physical postures, they vary in difficulty and intensity. With practise the idea is to build firmness, strength and flexibility of both the mind and body, so that you can concentrate (Dharana) and meditate (Dhyana) without distraction for a length of time. Some of the poses you may be most familiar with are: Triangle Pose, Tree Pose, Downward Dog, Cobra Pose, Lotus Position, Headstand and Shoulder Stand. The control of breath is an essential component to yoga practise, helping to increase your physical and mental endurance as well as encouraging concentration and improving clarity of thought. At its core yoga is said to balance the vibrating life force (Prana), minimising blockages that impact health and wellbeing. When yoga anatomy is considered, Prana is believed to flow through Nadi – 72000 channels providing vital energy all over the body that are essential for healthy living. The central Nadi (Sushumna) runs vertically through the mid-line of the body, intersecting the seven energy centres we already familiar with, known as Chakras. Pranayama practise leads to correct breathing, releasing mental tension as well as restoring and equalising the flow of Prana. You may be familiar with two of the breathing techniques – Humming-Bee Breath known as Bhramari and Alternate Nostril Breathing known as Nadi Shodhana. 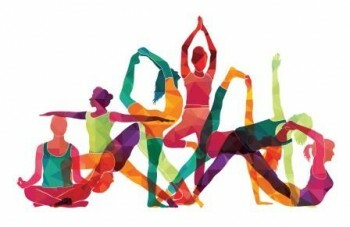 Yoga is often used in addition to conventional medicine as a way to improve health. The more obvious wellbeing benefits are relaxation, feelings of vitality, better posture, increased strength and muscle tone. But it has also been used for a wide variety of illnesses with positive effect, such as improving digestion, back pain, anxiety/stress, asthma, heart disease, blood pressure, IBS and more. *If you have any health concerns and are considering taking up yoga, then speak to your GP about its suitability, and continue to take medicines as prescribed.